Accomplished reed man Kelvin Christiane has played with everyone from Don Weller to Bernard ‘Pretty’ Purdie. Lately he has been helping keep jazz alive in south-west London, notably with his regular gigs at the Twickenham Jazz Club and the Home Guard Club in East Sheen, as well as releasing a steady stream of CDs. The latest of these is The Arrival which features Kelvin on baritone sax — in tribute to Gerry Mulligan — as well as flutes, with a nod to Roland Kirk, skilfully supported by Nigel Price on guitar, Larry Bartley on double bass and Noel Joyce on percussion and drums, with Ross Stanley on piano on one track and David McLeod substituting for Larry Bartley on bass on that same track — Alone Together. The Arrival is high calibre jazz. The CD is immaculately recorded, with great presence, and offers the listener an immediately engaging listening experience. The opening cut Joy Spring is insouciant, incisive and instantly lovely. Kelvin Christiane’s sweet, short boppish phrases on the baritone are intertwined with Nigel Price’s bright, agile guitar, underpinned with the buttery lushness of Larry Bartley’s bass. Kelvin sits out as Price solos with bittersweet precision, conjuring a whole big band’s worth of sound from his guitar. Then Price and Bartley swap roles, with the guitar providing rhythmic support and silvery frills while the bass solos, chunky, capacious and resonant. Finally Kelvin sweeps back in and his beacon-bright sax carries us out. 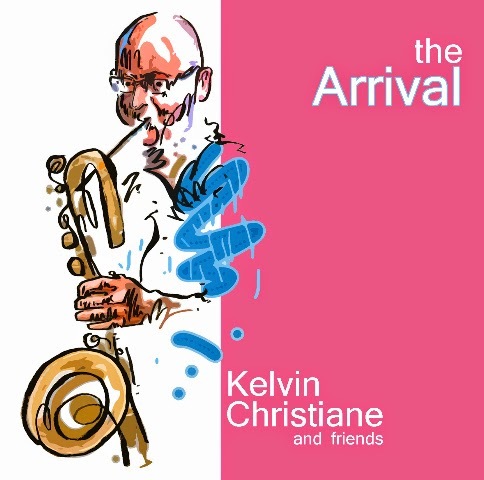 On the title track, The Arrival, an original composition by the leader, Kelvin Christiane supplements his baritone sax with the flute, and a very notable flute it is, too — breathy and hypnotic. Multi tracked, with interjections from the baritone, it provides a mesmeric hall-of-mirrors intro before giving way to a relaxed single flute as the tune evolves into a bossa nova delight complete with intoxicating, ticking percussion from Noel Joyce, almost subliminal bass and adroitly minimal guitar. Nigel Price’s guitar then fleshes out into a soulful, beautifully rounded solo. The flute is the perfect vehicle for this piece. Accompanied by the restless rustling and strumming of the bass it conjures up lush forests and Brazilian beaches. The musicians have all caught the bossa mood beautifully, with Price conjuring memories of Luis Bonfá. You can see why they named the album after this piece. It’s a hard act to follow. But Alone Together manages to do so. It is taken at a sweeping, swinging pace, Kelvin Christiane’s flute effortlessly keeping up and shifting gears with the changing time of the tune. Ross Stanley’s piano flows and cascades into a nicely judged solo, his lightning playing managing to pack extra notes and figures into and around the racing tune without ever sounding rushed. Noel Joyce’s abundant and pungent drumming provides an instructive contrast with the delicate discretion of his percussion on the title track. Alone Together concludes with a gorgeously piercing flute trill, recorded with the subtle ghost of an echo. As well as expertly playing bass on this track, David McLeod is also the recording engineer for these sessions and he is to be congratulated for the exquisite job he’s done. Lover Man sees Kelvin back on baritone— lush, velvety and resonant as he lays out the melody of this great standard. It is as wistful and lushly melancholy an interpretation as anyone could ever ask, with the baritone sax chiding, exhorting and declaiming as Kelvin Christiane conjures a boozy, bluesy late night mood before Nigel Price’s elaborate, vibrating spider web of guitar weaves an alluring pattern. The impressive neo-bossa of the title track showed a love and appreciation of Antonio Carlos Jobim’s music, so it’s no surprise to find two Jobim tunes included here, Once I Loved and Favela. They are amongst the highlights of the set, with some particularly fine use of percussive shakers by Noel Joyce. But then almost every track here is a highlight. This is a combo loving what they do, and their pleasure communicates itself loud and clear to the listener. It’s hard to imagine anyone not having their spirits lifted by the pacy precision and emotional depth of such well wrought music.